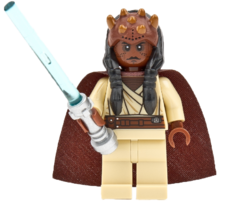 Agen Kolar is a minifigure based on the Jedi of the same name in the Star Wars universe, and appears in the set 9526 Palpatine's Arrest. Agen Kolar has plain tan legs, and a tan torso with brown hands, based on his skin tone. The torso has printing on the front and the back, with a brown utility belt and brown inner robe. Black outlining is also used, as is dark tan for creases in the outer robe. Kolar's head is brown, again due to the Jedi Councillor's skin tone in the Star Wars universe, and his face features a serious expression. Kolar's head also has a path of small black dots below each eye that curves upwards along the side of the face, representing Agen Kolar's facial tattoos. A Zabrak headpiece with hair is placed on top of Kolar's head, a piece which was formerly exclusive to Eeth Koth. The hair, which has two braids going down the front and one down the back, is completely black, and the horned section of the piece is brown. At the base of the piece is a continuing pattern of facial tatoos. Agen Kolar comes with two accessories- a brown cape and a blue-bladed lightsaber with a silver hilt. Agen Kolar was a Zabrak Jedi Master who sat on the Jedi Council during the Clone Wars. Kolar participated during the first Battle of Geonosis. When Mace Windu was informed by Anakin Skywalker that Chancellor Palpatine was the Sith Lord Darth Sidious, Kolar, along with Masters Windu, Fisto and Tiin went to arrest the Chancellor. However, Sidious engaged the Jedi team in battle, with Kolar being the first to fall to the Sith's blade when he was impaled through the chest. The group of Jedi were ultimately unsuccessful, with Sidious managing to kill Saesee Tiin and Kit Fisto, and eventually defeating Mace Windu with the assistance of Anakin Skywalker, who became Sidious' apprentice, Darth Vader. This page was last edited on 9 January 2016, at 22:59.